Radical Iraqi Shia cleric Moqtada Sadr says he is freezing the activities of his Mehdi Army militia for up to six months in order to re-organise it. He has also called on all its offices to co-operate with the security forces and exercise "self-control". 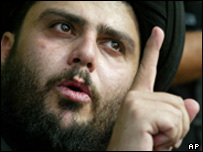 Analysts see the move as an attempt by Moqtada Sadr to regain control over his increasingly divided militia. The order was read out at a news conference in Karbala, where fighting on Tuesday killed more than 50 people. Police blamed the Mehdi Army for the violence, but it denied involvement. A curfew is now in force in the city, where the situation is said to be calm. At the Karbala news conference, one of Moqtada Sadr's aides read out a statement announcing that the Mehdi Army had suspended all its activities. What is the Mehdi Army? "We declare the freezing of the Mehdi Army without exception in order to rehabilitate it in a way that will safeguard its ideological image within a maximum period of six months starting from the day this statement is issued," Sheikh Hazim al-Araji said. In Najaf, another spokesman said the order included "suspending the taking up of arms against occupiers, as well as others". 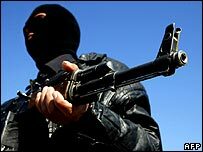 In April 2007, the US defence department described the Mehdi Army as the greatest threat to Iraq's security, replacing al-Qaeda in Iraq as the country's "most dangerous accelerant of potentially self-sustaining sectarian violence". The militia has split in recent months into increasingly autonomous factions, some of which the US says are trained and armed by Iran. However, the BBC's Mike Wooldridge in Baghdad says past experience of attempted purges of rogue elements in the militia will doubtless lead US and UK commanders to be wary and watch for the effect of the order on the ground. The Mehdi Army was created by Mr Sadr in the summer of 2003 to protect the Shia religious authorities in the holy city of Najaf. The militia strongly opposed the presence of the US-led coalition and took part in major uprisings against security forces in April and August 2004. It has also been linked to many sectarian attacks on Iraq's Sunni Arabs and has frequently clashed with rival Shia militia. The Mehdi Army has become one of the major armed forces on the ground in Baghdad and southern Iraq, with a membership of around 60,000, according to a December 2006 report by the Iraq Survey Group.